Speaker of the House Paul Ryan has spent his entire life dreaming of restructuring the federal government into an efficient machine for killing poor people, and now that Donald Trump’s ineptitude and the Republican Party’s general disregard for democracy have begun to make that dream a reality, he seems to preparing for his political career to come to an end. It’s understandable, since there’s only so much you can destroy when you’ve already helped set the planet on fire, but it would also probably be tough for anyone to continue holding an elected office when they’re as much of a shithead as Paul Ryan. News of Ryan’s possible departure comes from Politico, which spoke to “three dozen people” who know Ryan—including lawmakers, lobbyists, and whatever “conservative intellectuals” are—and “not a single person” thinks that Ryan will remain in Congress past 2018. 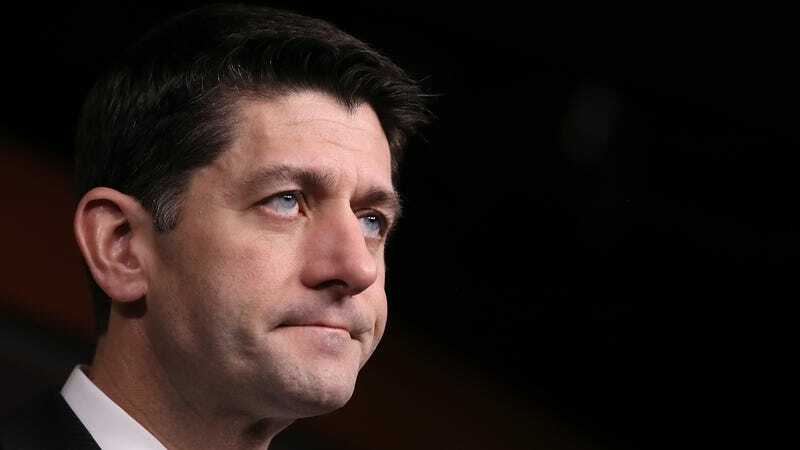 There are a number of reasons for that, including Ryan’s famous distaste for his role as speaker and his desire to spend more time at home before his kids grow up, both of which suggest that he might just retire at the end of his term. Even if he doesn’t retire, though, Politico doesn’t think his chances of sticking around are very good. He has a number of crucial bills that he’ll need to pass in the first few months of the new year, some of which may require breaking promises he made to Republican leaders or—perish the thought—working with the Democrats. If those things don’t work out, the Republicans might try to replace him as speaker, which would pretty much end his career anyway. Of course, if that does happen, the Republicans will have to find someone to replace him, and there aren’t any “universally acceptable” successors waiting in the House. Basically, Ryan might be screwed and the Republicans in the house might also be screwed, which is pretty good news for literally everyone else.